Book it to the OKC Zoo on Tuesday, April 9, to take part in Read Across Oklahoma (RAOK)! From 9 a.m. to 1 p.m., children will enjoy a variety of activities that promote reading and have an opportunity to participate in Oklahoma City’s Philharmonic Instrument Playground. 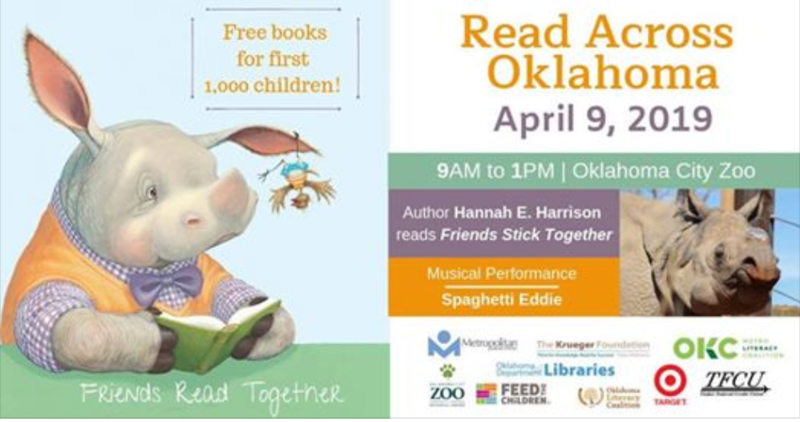 Oklahoma’s own Hannah E. Harrison will read her children’s book, “Friends Stick Together” plus, musical performance by Spaghetti Eddie! Free books for first 1,000 children and event T-shirts for first 100. ROAK is part of the statewide Ready to Learn initiative coordinated by the Oklahoma Department of Libraries. This program promotes literacy and helps build the foundation for a lifetime of learning, specifically targeting preschool children who may be at risk for low literacy. Event activities free with Zoo admission. Click here to watch the promo!